QuickBooks 2015 assesses finance charges on unpaid open invoices without considering any unapplied payments. Accordingly, you’ll want to make sure that you apply any payments and credit memos to open invoices before assessing finance charges. 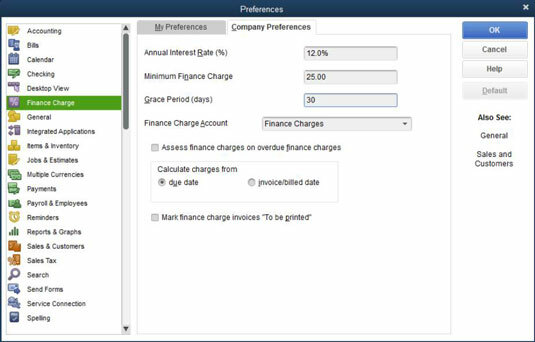 Choose Edit→Preferences, click the Finance Charge icon in the list on the left, and then click the Company Preferences tab. To be able to assess finance charges, you first need to set them up. 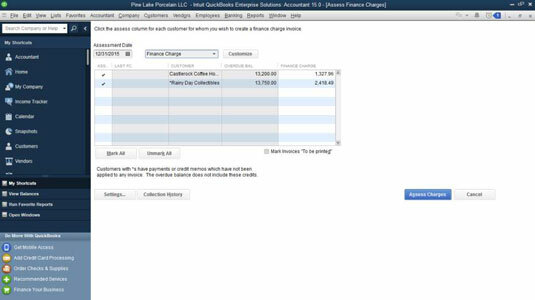 Only the QuickBooks administrator can change the company finance charge settings, and he or she can do so only in single-user mode. Enter the annual interest rate that you want to use to calculate finance charges. Move the cursor to the Annual Interest Rate (%) text box and enter the annual interest rate. (Optional) Enter the minimum finance charge, if one exists. Move the cursor to the Minimum Finance Charge text box and enter the minimum charge. If you always charge at least $25.00 on a past-due invoice, for example, type 25. Enter the number of days of grace that you give. Days of Grace. That sounds kind of like an artsy movie or serious novel, doesn’t it? Basically, this number is how many days of slack you’re willing to cut people. If you type 30 in the Grace Period (Days) text box, QuickBooks doesn’t start assessing finance charges until 30 days after the invoice is past due. Specify which account you want to use to track the finance charges. Activate the Finance Charge Account drop-down list and select an Income or Other Income type account. Indicate whether you want to charge finance charges on finance charges. Does this statement make sense? If you charge somebody a finance charge, and he or she doesn’t pay the finance charge, eventually it becomes past due, too. So then, do you calculate a finance charge on the finance charge? If you want to do this — and if state and local laws permit you to — select the Assess Finance Charges on Overdue Finance Charges check box. Tell QuickBooks whether it should calculate finance charges from the due date or the invoice date. Select either the Due Date or Invoice/Billed Date option button. As you might guess, you calculate bigger finance charges if you start accruing interest on the invoice date. Tell QuickBooks whether it should print finance charge invoices. Select the check box for Mark Finance Charge Invoices “To Be Printed” if you want to print invoices later for the finance charges that you calculate. After you use the Preferences dialog box to tell QuickBooks how the finance charges should be calculated, click OK.
Alternatively, click the Finance Charges icon on the Home screen. The Assess Finance Charges window appears. This window shows all the finance charges that QuickBooks has calculated, organized by customer. Give the finance charge assessment date. Confirm which customers you want to be assessed finance charges. QuickBooks initially marks all the finance charges, which means that it sets up a new invoice for each finance charge. (QuickBooks marks finance charges with a little check mark.) If you want to unmark (or, later, mark) a finance charge, click it. To unmark all the charges, click the Unmark All button. To mark all the charges, click the Mark All button. You can produce a collections report for any of the customers or jobs listed in the Assess Finance Charges window by selecting the customer name and then clicking the Collection History button. Click the Assess Charges button. When the Assess Finance Charges window correctly describes the finance charges that you want to assess, click Assess Charges. You’re finished with the finance charge calculations and assessments.